The Alberta SPCA said the investigation launched after dogs were spotted loose on the top of a pickup truck bed on roads west of Edmonton has concluded with no charges laid. Officials said the investigator had closed the file without laying charges against the driver. 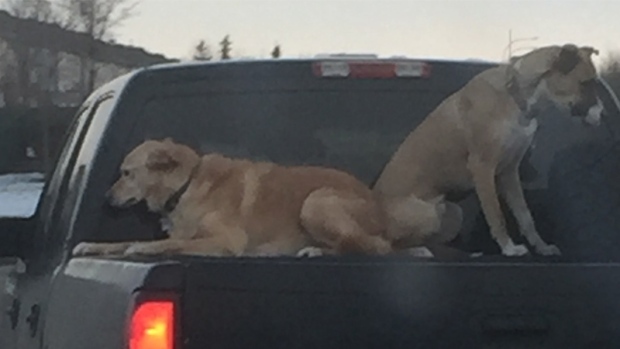 Photos of the vehicle – which was reportedly travelling at speeds in excess of 110 kilometres per hour on a highway in the Spruce Grove area with two dogs on top of the pickup truck bed – were posted on Facebook, and quickly sparked outrage online. “The Alberta SPCA hopes the attention given recently to two dogs in the back of a pickup truck west of Edmonton increases public awareness about the need to transport companion animals safely,” SPCA spokesperson Roland Lines said in a statement. “It is extremely frightening and frustrating to see animals transported in this manner, but that doesn’t mean charges are appropriate,” Lines said. 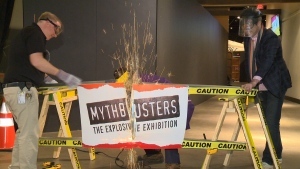 “If the animals are unharmed and if the investigating officer is confident that the subject acknowledges their error and will act differently in the future, a court prosecution isn’t necessarily warranted. The SPCA said some municipalities in the province have bylaws that include rules on the transport of animals, in those areas RCMP or local police could write a ticket – but the Animal Protection Act doesn’t give peace officers with Alberta SPCA the ability to write tickets for regulatory infractions, enforcement action would need to be prosecuted in provincial court.